Israël Yoroba Guebo is a 26 year-old multimedia journalist from Côte d'Ivoire that has been blogging about his country for over a year at Le blog de Yoro [Fr]. Now his efforts have been rewarded with the Best of Blogs award in the French language category, the prestigious international blog awards organized every year by Deutsche Welle. Last year another African blogger was chosen as Best Francophone Blogger, Global Voices friend Cédric Kalonji from the DRC, whom we interviewed on that occasion. Now we take the opportunity to interview Yoro too. How did you first hear about blogs and when did you start blogging? I had heard about blogs a long time ago, without really knowing what they were. But I can say that I've discovered this online universe while being the editor of the international section of a daily newspaper. I discovered blogs by journalists, writers, singers… that was 2006. And then my Editor in chief, Théophile Kouamouo, started his own blog where he shared his opinions. Seeing someone close blog inspired me enormously. On the 23rd of June 2007 I created my first blog on Afrikblog, where I touch all sorts of topics, from here or abroad. In that blog I don't have a clear editorial line, my ideas are quite scattered. It's like an exercise for me. Finally, in Decembre 2007 the ivorian blogosphere launched its own platform, Ivoire-blog. There I created Le Blog de Yoro [Fr] (Yoro's Blog), which is the one that has just received the Best of Blogs award in the francophone blog category. What were your motivations to start a blog? My first motivation was to show a different face of Côte d’Ivoire. You know, after the five-year war that we endured, the image of the country has been often soiled. I wanted to tell the world that yes, there has been war in Côte d’Ivoire, but we are on the path to peace. 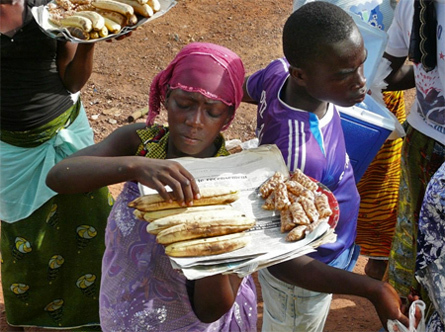 Above all I wanted to present the daily life in Abidjan, the economic capital, and in the rest of the country. I went from a little web exercise to a passion that today seems to me like a full-time job. Can you describe your blog for someone that has never read it? What are the issues that interset you the most? I tried to have a simple format, with a banner designed by myself. In general, in my blog I discuss issues and I write about current stories that are important for ivorians (here or in the diaspora) and for people that are interested in the Côte d’Ivoire, even for those that are only starting to hear about my country. Mostly I write about stories that aren't necessarily published in the papers, and I often give my opinion about current affairs. Do your family, friends and colleagues read your blog? Yes, they all know my blog. At first, I had to force them a bit to come and read it. I put all their email addresses in my blog newsletter, so every week they received a digest. But after that they didn't wait for the newsletter anymore and read the blog by themselves. They really encouraged me to keep my blog alive. Why did you decide to write your blog in French? French is the language I can express myself the best, I don't speak our local languages well and also French is Côte d’Ivoire's official language. Could you describe the ivorian blogosphere? In Côte d’Ivoire, blogging is still very new and not very developed. Internet is not very widespread and very expensive. Most people don't know much about internet tools and so they usually they limit themselves to chats and forums. I used to write my blog from an internet cafe but it wasn't very convenient, so I decided to invest in an internet connection at home. It has a speed of 256 kb/s, and it costs me 20,000 Fr CFA (about 25 euros) a month. That way I can blog whenever I want. 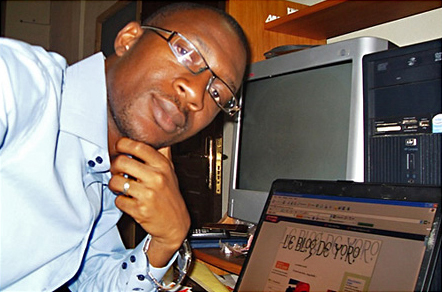 The ivorian blogosphere started to take shape mostly since the launch of Ivoire-blog.com. Nowadays I would say there are about a hundred ivorian bloggers, including those that blog in other platforms. In your opinion, what are the issues that concern ivorian bloggers the most? In general, ivorian bloggers are interested in development issues in Africa. But there are blogs specialized in advertising, communication for development, development strategies, current affairs analysis in Côte d'Ivoire and in the world. You can also find blogs focusing mainly on Web 2.0 and new technologies of information and communication (NTIC) in general. Are there any freedom of expression issues in Côte d'Ivoire? In Côte d’Ivoire, there is a complete freedom of speech. You can find in ivorian dailies things that in other countries would put the lives of journalists at risk. You can also see that in my blog there are no taboos. I talk about any issue. And I let visitors leave comments as they wish. I've never had any problems for saying one thing or another. Have you met other ivorian or African bloggers thanks to your blog? Yes, I have met ivorian bloggers. With some of them I have even become friends. And I have also met many other people from here or from Europe thanks to the the blog, and have developed a friendship with them, albeit virtual for the time being. But I'm convince we'll meet one day. What do you do in life, when you are not blogging? I have to confess that blogging has become almost like a job for me. I blog almost all the time. Otherwise, I'm also a journalist and I take care of my little family. What are your main interests, besides blogging? I'm Christian, and I'm also a musician. Religion and music have an important place in my life. But I like reading and most of all traveling. What are your wishes for your blog after receiving this important award? I wish to make it more professional. You know, I work with a small point and shoot camera that is not even mine. Currently I'm trying to purchase a more professional one. And when you listen to the quality of my interviews, it's atrocious. So I'm also looking to have a better microphone. Overall, I'd like my blog to become more professional and to have my own domaine name. I also have another project involving blogs in Côte d’Ivoire, but you'll have to pardon me not telling you more. You should just know that after this award I'm hoping to meet other bloggers all over the world in order to learn from their experiences and share mine as an ivorian blogger. I'm also really looking forward to participate in interesting bloggers conferences and meetings.